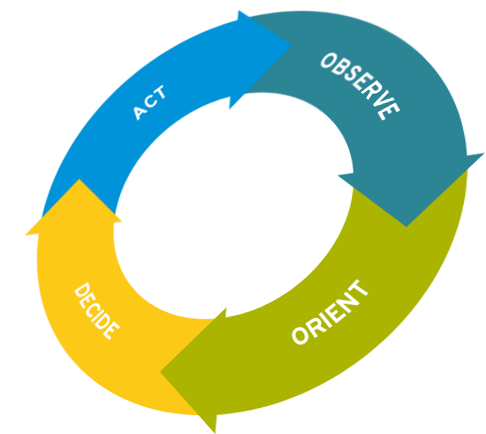 I have been a student and advocate of the OODA loop for many years. It has real application and value in missions, Church planting, even understanding what to do (and what not to) in hostile cultural surroundings. I recommend it to any and every student of mission and homiletics. Here’s why. In 1961, at age 33, he wrote “Aerial Attack Study,” which codified the best dogfighting tactics for the first time, became the “bible of air combat,” and revolutionized the methods of every air force in the world. His Energy-Maneuverability (E-M) Theory helped give birth to the legendary F-15, F-16, and A-10 aircraft. Perhaps his most significant contribution to military strategy, though, came from a series of briefings he gave. In them, Boyd laid out a way of thinking about conflict that would revolutionize warfare around the world. I have spent the last month diving deep into the OODA Loop – reading everything available on it, from Boyd’s briefing notes to biographies to analyses of the theory by other authors. I also met with Curtis Sprague, a former U.S. Air Marshal and Lead Instructor at the Federal Air Marshal School in Dallas, and an avid student and instructor of the OODA Loop, to get his insights. Below you will find a synthesis of what I have learned. My goal is to provide the most thorough, but also accessible primer on the OODA Loop out there. To begin your journey in mastering the “Tao of Boyd,” read on.